Frantic and fast paced time management fun. Feels a bit repetitive over time. 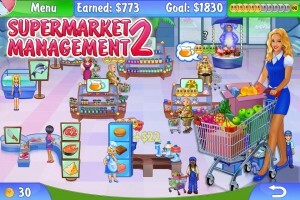 Supermarket Management 2 is a fast paced look at life in the grocery aisles. From stocking shelves to calming customers, you need to do it all – and fast. Even with a variety of upgrades available, your success in each level is dependent upon your timing and skill, making for a game that is both relaxing and casual. 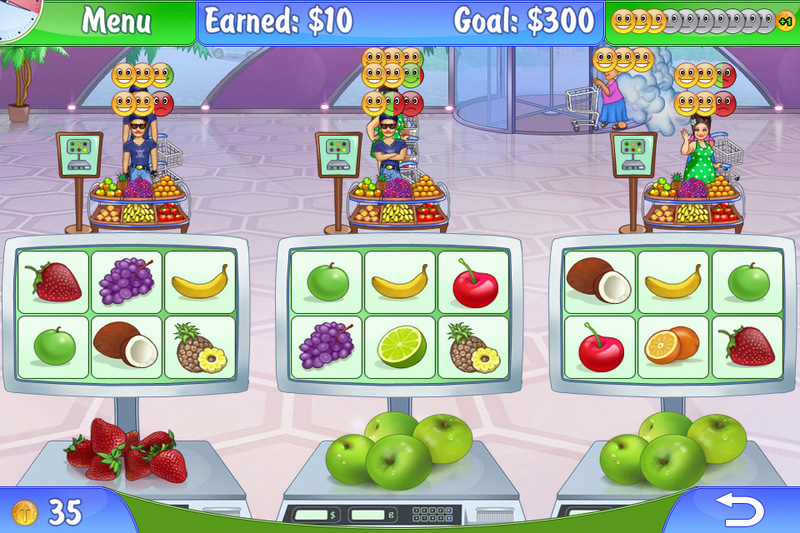 While it does get a little repetitive at time due to the very nature of the game, it’s a fun time waster that will have you tap-tapping your way to supermarket glory. We’ve all been there. There you are, spending your days working for the man, toiling away in a grocery store but never really getting anywhere – until one day you finally work up the courage to strike out on your own and open your very own store. Oh, you haven’t been there? Well, you can be now, ‘cause Supermarket Management 2 puts you right into the supermarket action, as you work your way up from a single small store to a giant mega store with loads of products and a steady stream of customers. Supermarket Management 2 is a time management game that keeps you tapping furiously from start to finish. While the difficulty ramps up pretty steadily, it never gets gets truly frustrating. Instead, it’s a nice blend of true challenge and casual gaming. The basic idea is that you have opened a store, and now are responsible for all aspects of keeping it running. When you begin the game, you have small store without a lot of products, and no employees to help you out. 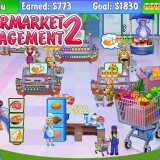 You will stock shelves, work the till, and put away the carts. 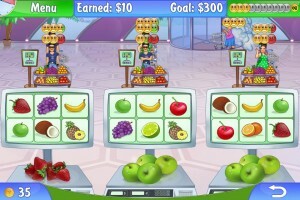 As you advance in the game, more tasks are added, including a deli, bakery, fish tanks for fresh seafood, free sample booth, and a fresh fruit stand. Each of these needs some sort of interaction for each customer that uses them. For instance, at the deli you watch the customer’s face to see how much product the want, and in the bakery you’ll perfectly time adding frosting and decorations to cakes on a conveyor. What this means is that your character will be running franticly around the store, trying to please all the customers before they get irritated and leave. As things get harder, you’ll want to take advantage of the opportunity to purchase upgrades. These range from larger shelves (which need restocking less often) to more shopping carts, to employees to help out with some of the workload. These upgrades are purchased using coins that you earn at the end of each level. The better your performance, the more coins you earn (you do have the opportunity to purchase coins using real money, but it is in no way necessary). While all of this makes for some frantic game play, it really can start to feel too repetitive at times. To fix this, the game mixes it up by adding challenges and sales. The challenges change up the action in a variety of ways. You may have problem customers, employees needing breaks, and even a strike to contend with. All of this must be accomplished while still meeting the dollar goals needed to pass each level. The sales levels are a complete departure from the standard levels. 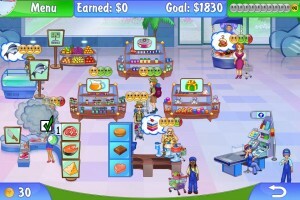 They use just your character, and a fast paced line of customers who need to be quickly served whatever item is on sale.